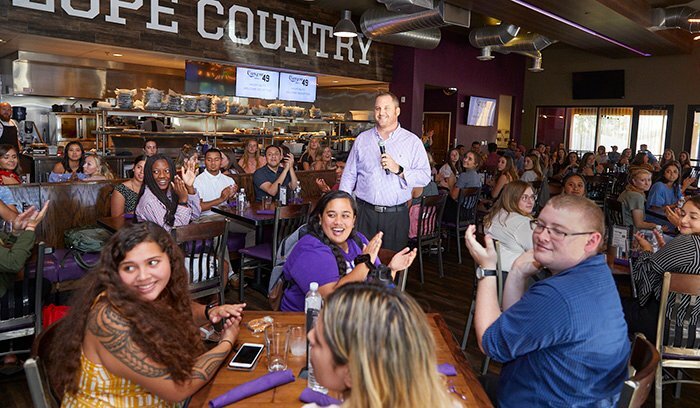 Brett Cortright presides over the GCU hospitality program’s kickoff event, which packed the Canyon 49 Grill. It’s one thing for an academic program to grow. A new degree is offered, students seek it out and their numbers expand. Seems simple enough. But growing a reputation at the same time is far more challenging. 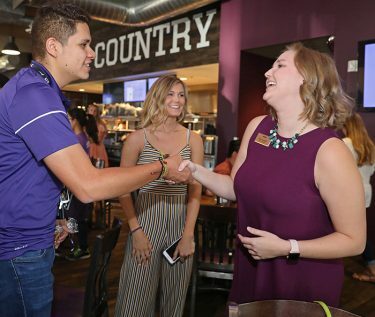 Brett Cortright, who manages the hospitality program at Grand Canyon University, couldn’t help but think how much has happened in just three years as he surveyed all the students spread out across every table of the Canyon 49 Grill for a get-acquainted event. GCU alumna Katie Casteel, now the Catering Coordinator at Desert Mountain Club, speaks to the hospitality students. 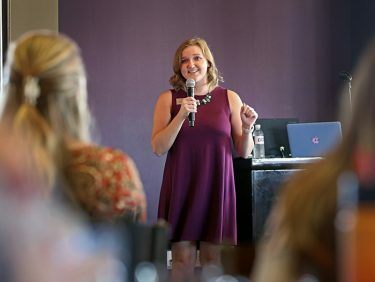 The event also was an opportunity for the nearly 200 students in the Colangelo College of Business (CCOB) program to hear from one of its first graduates, Katie Casteel. Her story reflects exactly what Cortright is hearing from prospective employers. By working in an East Coast cruise ship, three restaurants (two of them GCU businesses) and another GCU-related venture, the Mission Possible Café, Casteel had put in far more than the 600 hours of industry work experience the hospitality program requires. That made her eminently hirable after commencement in December. She was snapped up to be the first intern at the prestigious Desert Mountain Club in Scottsdale, which features six golf courses and six clubhouses. “I got to do so much in my time at GCU, and that really translated very, very well when I started working at Desert Mountain,” she said. “I was able to show them what an internship was supposed to be. Francisco Lamadrid (left) and Bryce Weinrich greet Casteel following her presentation. The result: After just three months as an intern, she was hired full-time to be the catering coordinator. “My dream job,” she said. Casteel graduated in just 2½ years thanks to the 32 college credits she had earned in high school. And not only did she take advantage of the on-the-job experience she got at GCU; she also made good use of what she learned in the classroom. Her most beneficial class, she said, was her food and beverage management class in her final semester. The skills she developed there were put to immediate use at Desert Mountain. “I could show them, ‘Hey, I know how to calculate food costs. I know how to do a bar. I know how to take inventory of things,’” she said. One of the interested listeners as Casteel spoke was Megan McCreary, who’s just starting out at GCU after transferring from a highly regarded university back east. She already is seeing the benefits Casteel endorses. For one thing, she said, she made more friends in her first two weeks at GCU than she made in two years at her previous college. The fact that GCU is a Christian university was a big draw for her. But her No. 1 consideration was the quality of the hospitality program, and GCU’s “stood out so much,” she said. McCreary’s goal is to own a hotel someday, and she knows that won’t happen unless she understands every aspect of the industry. She wants to stay on campus next summer and work at the GCU Hotel. She also is excited about joining the newly formed Hospitality Club. Yaron Ashkenazi has the kind of job to which McCreary aspires. He’s an award-winning international hotelier who, just four months ago, was named CEO of Oxygen Hospitality Group, a hotel real estate and investment management company. When Ashkenazi needed to start hiring, a business partner who was impressed by the GCU hospitality program suggested it would be a good place to begin. Now the company touts seven employees … and four of them are GCU graduates. He got the same vibe from talking with current students at the Canyon 49 event. And the difference between what’s happening now and what it was like at the program’s inception in August 2015, when his enrollment was a dozen, is that he has far more students to educate. “The program’s success is a direct result of the access our hospitality students have to Brett and his team and their experiences in the learning laboratory he has created in our hotel and restaurant,” said Dr. Randy Gibb, the CCOB dean. It can be difficult to properly measure the growth of an academic program. But, sometimes, it’s sitting right in front of you.